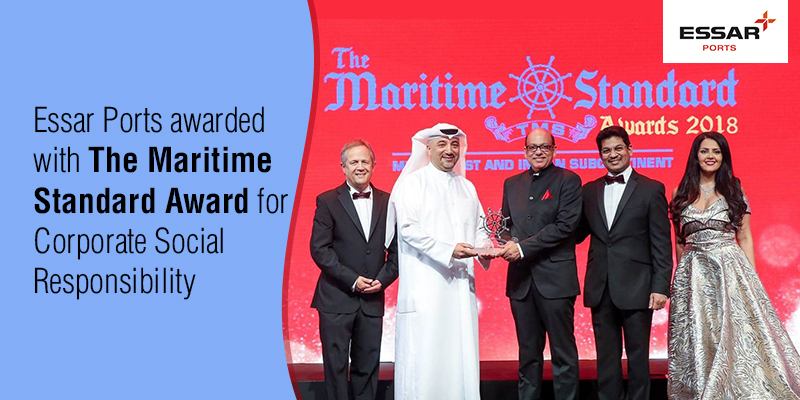 The fifth annual Maritime Standard Awards was held on 15th October, 2018, at Dubai. Hosted by renowned BBC journalist, Tim Willcox, the Awards were attended by a high-level audience comprising more than 700 executives in shipping, ports, shipbuilding and repair and related sectors, from almost 70 different countries. Essar Ports was nominated, along with prominent national and international players in four categories which included – The Safety and Security Award, Terminal Operator of the Year, Port of the Year and the Corporate Social Responsibility Award. Congratulations to the team on winning the award for Corporate Social Responsibility and being nominated in the prestigious categories.